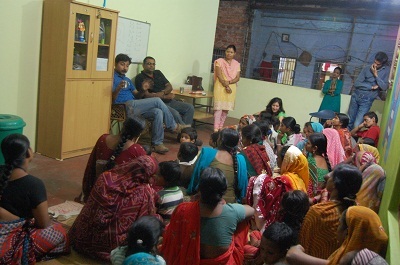 Seed for Change's doctors during their meeting with the parents. Since we found out that Shivani contracted tuberculosis, one of our students in the Dashaswamedh centre, we wanted to help her family to obtain the best health care possible. We worry about the health of Seed for Change's children, especially as India and China together consist of 40% of tuberculosis cases in the world, according to the World Health Organisation. We worry because there exist more cases like Shivani. Therefore, Maria and Seed for Change's coordinators liaised with our doctor, Dr Yogesh Tripathi and with a tuberculosis expert to inform parents of the Dashaswamedh neighbourhood of the situation. They explained to them how to avoid infection and what the symptoms are. Furthermore, we made the most of our meeting with parents to give out anti-lice shampoo and to let them know that Shivani is getter better, that she is no longer infectious and that she can return to class. Antara with her students in front of the computer. Last week, we received a very special visit in our office: Antara, the teacher, wanted to teach students how to use a computer. The older ones, in first and second year, had only seen how this is done in a book. After seeing the look on their faces and smiles, Laura, the volunteer who coordinates the school programme, volunteered to give students extra curricular IT classes in order to allow them to improve and practice their skills with a real computer, rather then reading a book about it. Our first weeks of work in Seed for Change's projects have been and continue being very intense. This has been a real adjustment for us newbies and hard work for the younger children who are in the middle of exams.The heat is now less suffocating in Varanasi and we are pleased to work in cooler conditions. It seems that India never sleeps. There is a continuous coming and going in the streets and the atmosphere is even livelier now as it is the day before one of the most important festivals in the country: Durga Puja. The enthusiasm affects everyone, including the children: they are very excited, play until they drop and smile much more than usual. Just as when we taught them how to play Twister. Laura, Soma and Antara teach the children how to play Twister. Durga Puja also symbolises the end of their exams. For 4 days, they will leave to one side their books of maths, Hindi and English in order to enjoy a week filled with offerings and visits to temples. For us, the new volunteers, it will also be our first Durga Puja, therefore, we will tell you all about it in our next blog. Just as much as the children, we also want to have fun in the festival!